A direct line to the source of Jura Whisky. Located off the west coast of Scotland, Jura has one road with three phone boxes. With limited phone reception, these phone boxes are one of the ways the Islanders stay connected to each other and the rest of the world. 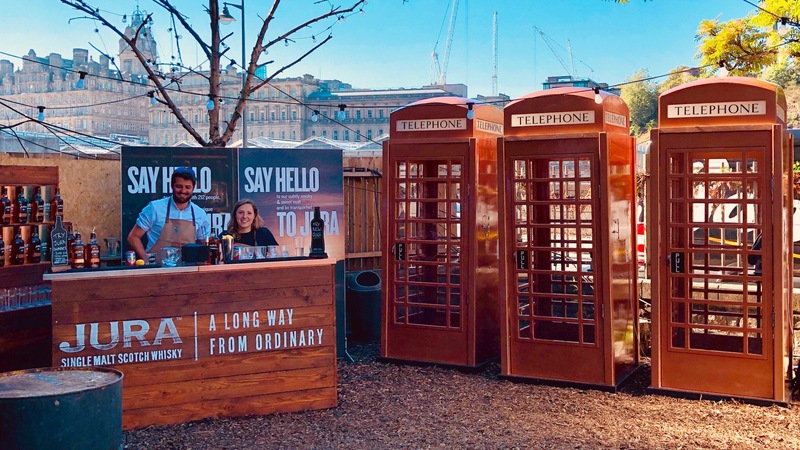 Earlier this year, Jura Whisky launched an entirely new range and our mates at creative agency Punk came up with the idea of replicating Jura’s three traditional phone boxes to tell the Jura story across the UK and beyond. We were approached to build the pay phone tech. The idea was to take real pay phones and adapt them so that users anywhere in the world could hear from real residents of Jura. Using IVR-style menus (“press 1 for X, press 2 for Y”, etc) we’d let users speak to a number of local characters and hear directly from them what they like about Jura, both the island and the whisky. The brief was that the devices had to work offline, anywhere in the world, so we had to make them completely standalone, requiring only 110-240V mains power. We started by sourcing a standard UK pay phone. Made by Solitaire, it’s the kind of vandal-proof steel unit you might find in a shopping centre or airport. The good news is that it looked the part and was really sturdy. The bad news is that the whole inside of the phone was a single PCB, with everything from the LCD display to the on-hook sensor surface mounted. We therefore had to start from scratch. First, We designed a custom baseplate which mounted on the standard PCB mounting holes, allowing us to fit a new Adafruit membrane keypad, microswitch and Pimoroni Display-o-tron Hat in place of the standard PCB. We started with a handmade plywood prototype where we could make adjustments quickly and easily. Once everything was reliable, We transferred our design into a CAD drawing to be laser-cut from Perspex. Behind the baseplate we mounted a Raspberry Pi to act as the brains of the device. The on-board sound from the headphone port does double duty, providing both the sound heard through the handset and the incoming ring tone, which is in turn triggered by a PIR sensor; the phone automatically starts ringing whenever anyone walks past the phone box. To complicate things slightly, the plan was for the phones to tour the world sampling different expressions from the Jura range. In each location there would be three drams available, but this selection would vary from place to place. We created a simple menu system using the LCD screen, allowing staff to easily choose which three drams they wanted on tap at each location. Once the first phone was complete and thoroughly tested we repeated the build for the second and third phones. We then took them through the Edinburgh for their public and press unveiling at the Fireside pub, from where they’re being launched and toured by experiential agency Badaboom. The phones are spending a couple of weeks at Fireside before moving on to a wider UK and world tour. Dates and locations will be announced in due course.